Challenge Detroit – Sunny D! Summer is in full swing in Detroit! And every Detroiter is eager to take in as much sun as is humanly possible. Here are the best places to get your daily does of vitamin D in Detroit. 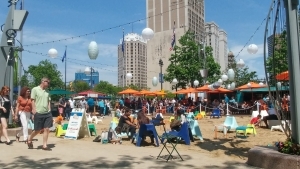 Sand, music, and drinks in the heart of Downtown Detroit. Need I say more? 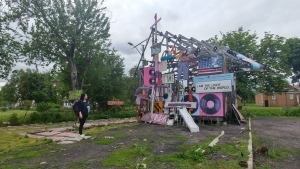 The Heidelberg Project is an outdoor art installation spanning a couple of neighborhood blocks. The art pieces are made up of found and recycled objects acquired over generations. The Dequinder Cut is a 2- mile greenway that starts at the Riverfront and end in Eastern Market. 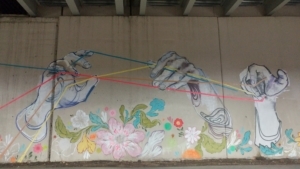 The designated walk and pathways feature captivating murals. 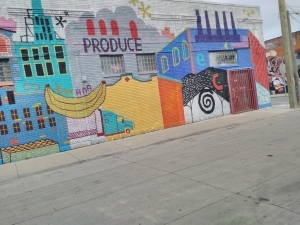 Eastern Market is so much more than kale, apples, and cheese samples. There are so many vividly painted murals that on building surrounding Eastern Markets Sheds. Grab an Michigan apple and take away around the industrial complex. You eyes and and heart will thank you!